Like the title says, we’re here to talk about macaroons, referred to by the official website of France as “seductive little biscuits,” and chocolate, traditionally consumed on Valentine’s Day. If you read the play “A Doll’s House”, then you probably remember Nora’s obsession with macaroons and the significance of this simple cookie in the play. A similar theme plays out in the movie “Chocolat” where chocolate is taboo during Lent but its overwhelming allure leads the residents of a quaint French village to hide their consumption of it from the mayor. 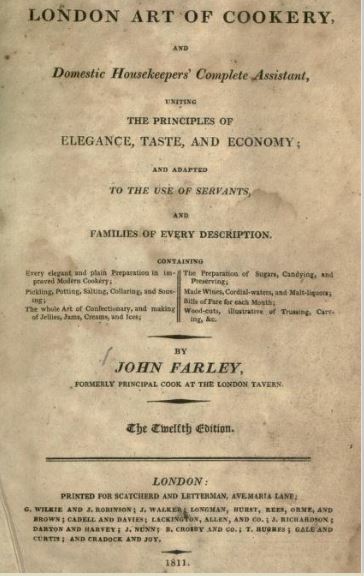 I’m using a recipe from “The London Art of Cookery and Domestic Housekeepers’ Complete Assistant On a New Plan Made Plain and Easy to the Understanding of Every Housekeeper, Cook, and Servant in the Kingdom,” written in 1783. How’s that for a title? We have the print edition in Special Collections, but there are also other digitized editions available. An important distinction needs to be made. Macaroons, as they are made in France, are almond biscuits sandwiched together with jam, chocolate, or other sweet fillings. The “other” type of macaroons contain shredded coconut. 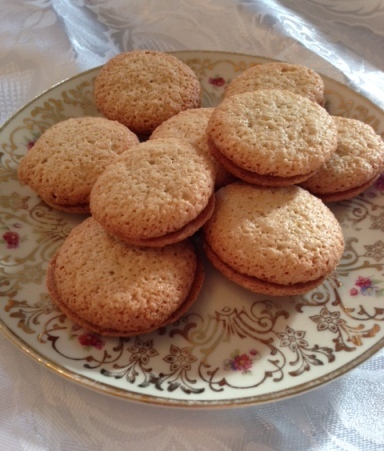 And although the recipe from The London Art of Cookery simply calls them Macaroons, it’s actually a recipe for French macaroons, not coconut macaroons. It’s confusing. I know. One detour from the recipe will be the addition of chocolate ganache filling between two macarons, which is how they would be made in a French pattisserie. 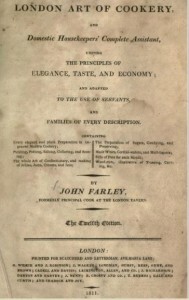 I will use the 1783 recipe for the cookies and a Food Network recipe for the ganache. And of course, I had French cafe music playing on Spotify, for inspiration. 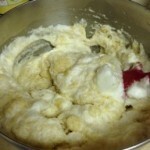 After combining the sugar, almond meal, and a few drops of rose water, I stirred in the frothed egg whites. 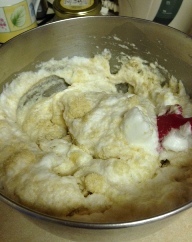 The egg whites should form stiff peaks before being added to the sugar and almond meal. Using a small spoon, drop round dollops of batter about two inches apart on a parchment paper-lined baking sheet. Or you can use a pastry bag. The recipe ends with the instruction, “put them in the oven” without so much as an oven temperature or length of cooking time. I checked the Food Network for a suggested oven temperature (325) and time (13-15 minutes). There was no measurement for the rose water so I used ½ tsp., but next time I would skip it altogether. It was a noticeable and not necessarily pleasant flavor, but that’s just my opinion. Luckily, the chocolate ganache soon remedied that. The cookies came out a little flat, not like the macarons I’ve come to expect. They tasted good so, who am I to complain? One last tip: make extra ganache. It’s great for dipping strawberries. I want to thank Michael Foight and Laura Bang in Special Collections at Falvey Memorial Library for locating suitable recipes from Falvey’s print and digital collections. Their help was invaluable. ‘Caturday feature written by Luisa Cywinski, writer, Communication & Service Promotion Team and team leader, Access Services. Re: oven temperature missing from recipe. Before the advent of electric and gas stoves, ovens had no temperature controls. It was up to the cook to determine how long to bake depending upon how hot her oven was. My grandmother had a wood stove in her kitchen and baked delicious cookies in its oven.